Of course, the easy way is to insert a circle, and use the Appear or Fade entrance animation. Be sure to format the circle with no fill. I like to use a red outline and give it a weight of at least 2 pt. To format the circle, right-click and choose Format AutoShape (in 2007, Format Shape). In the Fill section, choose No Fill from the drop-down list. In the Line section, choose a red color and change the Weight. To add the animation, select the circle, and choose Slide Show> Custom Animation. (In 2007, choose Animation tab> Custom Animation.) Choose Add Effect> Entrance> Appear or Fade. 1. Insert a circle over an object. Format the object as just described so that it has no fill. 4. Choose Add Effect> Entrance> Wheel. 5. In the Custom Animation task pane, change the number in the Spokes text box to 1. 6. Play the animation. You’ll see the circle drawn around the object. 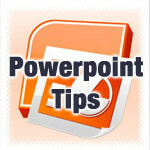 PowerPoint Tips Microsoft Power Point, powerpoint. permalink.